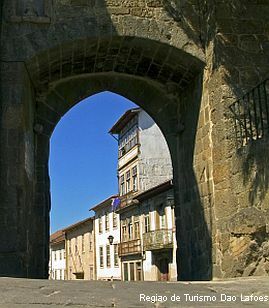 Viseu is located in central Portugal between Porto and Lisbon. Its name goes back to the Roman era and derives from the Roman word 'viso' which means a good view. This is because the original settlement was built on a high vantage point. After the Romans it was conquered the Moors who ruled over Viseu for the next hundred years. Evidence of this era can be seen in the historical quarter known as Centro Historico. This charming maze of cobbled streets and alleyways has no less than six major churches, several chapels, and two convents. Here too you will find the town's Romanesque and Gothic style Cathedral. It was built in 830 AD and contains a museum with exhibits of sacred art. The Bishop's palace is also in this historical part of town, and equally worth seeking out. One of Portugal's greatest 16th century artists was born in Viseu, Vascos Fernandes. The town has a museum in his honour called the Grao Vasco Museum with an excellent exhibition of his works. In 1892 the Saint Teotonio hospital was opened and is located near the centre of town. 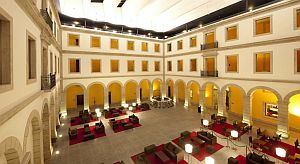 In 2007 the building was converted into a Pousada, a hotel group offering outstanding quality accommodation. The Pousada de Viseu has no less than two restaurants serving regional dishes, fantastic spa facilities, indoor and outdoor swimming pools, as well as gym. So it is a marvellous place to come back to at the end of the day to relax. Relaxing is a tempting option in such beautiful surroundings. However, there are just so many outdoor pursuits to enjoy, this is when the spa facilities come into their own, as an excellent way to unwind and ease any tired muscles. Less than an hour away, heading south east, is the Serra da Estrela Natural Park. This is a protected area of outstanding beauty and the perfect backdrop for several outdoor activities, some more extreme than others. The historic village of Linhares da Beira and the Mondego or Zezere valleys have become popular destinations for hang gliding. For hikers and those who enjoy off road activities such as mountain biking, there are over 375km of stunning trails. You can also go canoeing or swimming in the rivers. The Serra da Estrela is 2,000 meters high which means during the winter there is good skiing. You can even ski in the summer months as the town of Seia has artificial slopes. But for those who do not ski, there are alternative ways to enjoy the snow such as snowmobiling and snow shoeing. For golf enthusiasts, there is a course near Viseu that was actually the very first golf course built in this region. The Golf de Montebelo Club covers an area of 200 hectares with an unforgettable final sequence that has exceptional views of the Serra da Estrela and Serra do Caramulo mountains. Finally, if you are trying to decide when to go, you may wish to time your visit with two big festivals that are held in Viseu. Between August and September, they hold the Viriato Music Festival and the Sao Mateus fair which is one of the best known fairs in the region.